So you’ve decided to become a Panda. It’s a big life decision, we know. Friends may stop talking to you. People will look at you differently on the street. Your family may stop answering your calls. Ok, perhaps a bit dramatic, but we’re very excited to help you on this journey into action packed awesomeness with Taichi Panda. To do that, we’ve compiled a little list of commonly queries for players new to Taichi Panda. I’m new, what server should I use? That is totally up to you! All servers are cross-platform – meaning players from Android and iOS play together. The server names have a country code attached, as a helpful reminder of where they are. US = United States, CA = Canada, AU = Australia, and EU = Europe. These are not restrictions, but recommendations for the optimal server connection. There is also a number listed – S# - telling the age of the server. The first servers to go live were listed as S1, which means they will be relatively old and filled with veteran / high level players. If you want a fresh start, try going for the most recently opened servers, which will have higher numbers. 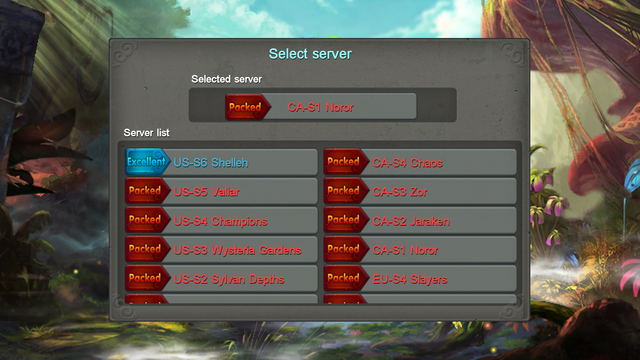 As of March 26th, we have 2 brand new servers – US-S4 Champions, and EU-S1 Neptune. For new players in North America and Europe, we recommend these two. However, players who would like to play side by side with experienced, high level players can also join those other servers. Once I’ve made a character, do I have to stay on that server? While you can create new characters on other servers as much as you like, you will be unable to move a character from one server to another. Be aware of this when you choose the server for your characters. I get a connection error message, what should I do? If you receive this message, it may be because your internet connection is unstable. 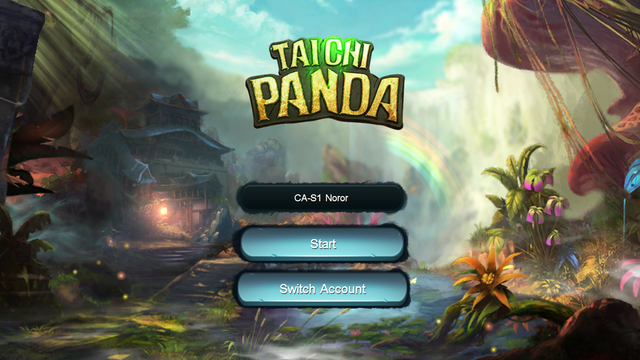 Taichi Panda requires an internet connection to play, so be sure to check your connection before playing. If you experience problems, try switching between data and WiFi. If problems persist, contact Support@SnailGamesUSA.com for more help. I made a character, but now I can’t find it. What happened!? How do I get it back!? Woah sparky, calm down. First, make sure that you’re using the same login. There are a number of ways to log in – including Facebook, Google, email, or an automatically generated account name. Make sure you are using the same login when entering the game, or else you will not have your character. Also, be sure you’re on the same server. Characters do not carry over from one server to another. 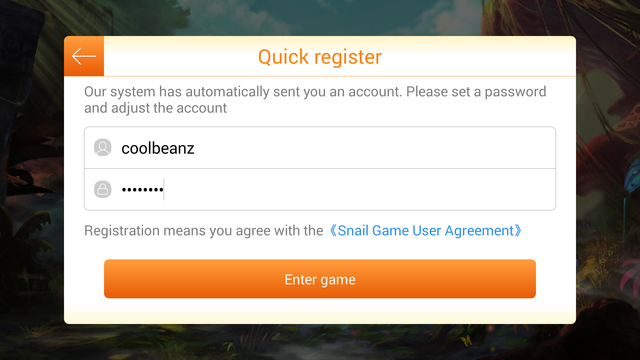 If you are having problems finding your character, remembering your password, or generally logging into your account, please send an email to Support@SnailGamesUSA.com with as much info about your account and characters as possible, including: Account Name (used to log in originally), In-Game Name of character, and Server of character. I won a gift during a community event, what do I do now? There are two general situations you may find yourself in: With a Code, or Without a Code. If you have a code, simply visit our Gift Center at http://panda.snail.com/static/en/gift/. If you’re on a mobile device, be sure to continue to full site, as the mobile Gift Center is not available at the time of this posting. Simply log in to your Snail Passport, and enter the Gift Center. Fill in your code, select the type of code (this should be provided to you when receiving the code) and your server, and the rewards will be sent automatically. If you don’t have a code, then you’re in luck! We will have taken down your information directly, through social media or forum messages, and will send the rewards to you. Directly sending rewards takes time, so please allow 3-5 business days to expect them. If you do not receive them, send an email to TCPcommunity@SnailGamesUSA.com with all relevant screenshots from the event to claim your rewards. I want Diamonds, how do I get them? How do I “Top-up”? It’s really quite easy actually! Along the right side of the menu, there is a button labeled “Store”. In that menu, you will be able to see optional packages for making In-App Purchases. With your purchase, you will gain Diamonds, as well as VIP experience which will allow you to upgrade your VIP level and access even more privileges. I’ve seen player with Wings, how do I get them? With your first top-up of any quantity, you will receive a First Top-up Reward, including Large Constitution Pills, 150,000 Gold, and a set of Wings! These wings, when equipped, will allow you to get an HP drain – meaning you’ll regain health with each Basic Attack you land on enemies. This set is the most basic in the game, upgrade to higher VIP to get better wings! How much do I pay to reach certain “VIP” levels? Below, we’ve prepared an easy chart to show how much money will get you to a certain VIP level. Note: all quantities are listed in USD. This is based on standard prices, not extra experience earned from special promotions. VIP 1 – 0.99USD, and gets you Quality 16 Wings! How do the different cards work? The Monthly, Seasonal, and Yearly cards? And what about the Super Daily Card? These cards are special deals you can use in order to get awesome daily rewards of Diamonds! By purchasing a given card, you will receive a specific amount of a daily reward of Diamonds for that duration – a month, a season (3 months), or a year (12 months). These Diamonds must be claimed in the Achievements section every day, or they will be lost. The Super Daily Card is a new top-up card added with the latest update. This card, with purchase, will give you a Daily reward of 100 Diamonds FOREVER. That means that when the Sun collapses in on itself and life ceases as we know it, you will still be able to claim the rewards from this card! The Super Daily Card can also stack with the other cards, allowing you to get even more daily Diamonds if you have both. What currency are things listed in? Currencies in the store should be listed in the local currency of your Apple / Google Play ID. Certain on sale items will be promoted throughout the game. These will be listed in a specific currency. If no currency is given, the default should be US Dollars. One last thing: why can’t I share to Facebook? This function has run into some technical problems, despite our best efforts, and at the time of this posting is not working. Please be patient as we work out this problem. Just know that you are not receiving an unfair disadvantage. So you’re new to Taichi Panda, and looking to join the fun? 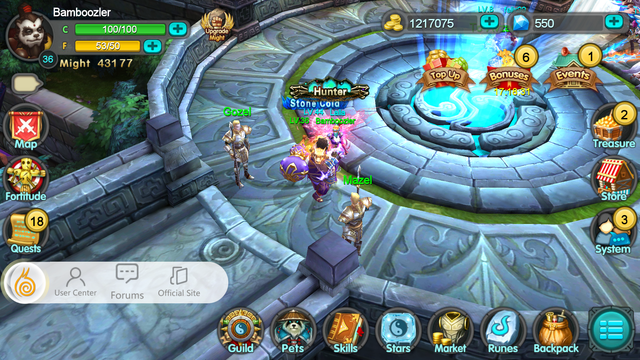 Here is a step-by-step guide to getting yourself an account and enjoying the game! 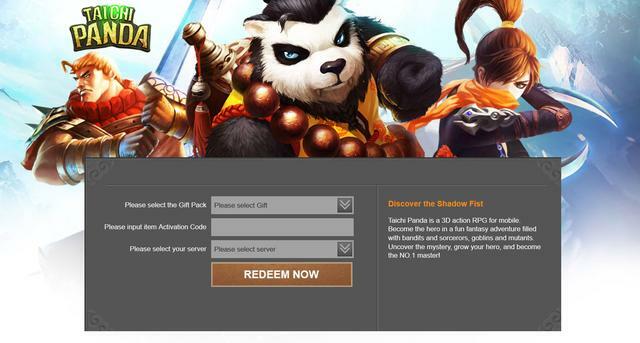 When you first open Taichi Panda, it will give you the choice to quickly enter the game with your most recent account. Entering is as easy as hitting “Start”. This will log you into the account most recently used, and on the server most recently entered. If you’ve never logged in before, it will take you to the account login menu. If you’d like to switch servers, simply click on the name of the server above the “Start” button. This will bring up the list of all servers. Characters are tied to specific servers, so be sure to remember your server, as your characters won’t load in others. We’ll explain how each of these works below. Entering as a guest is very easy. All you have to do is click on “Log in with a new account”, and click “Enter as a guest” in the bottom corner. This will give you an account without the fuss of a password or log in. From then on, simply click “Start” and you’ll enter the game. However, it is important to note, Guests will not be able to log in on other devices. To ensure your data is preserved, be sure to link your account to your email. If you’d like an account fast, simply use the Quick Register function. When you open the login menu, just click “Log in with a new account, and then click “Quick Register”. The Quick Register will give you a randomly generated account name. This can be edited as you wish, or kept the same. Put in a password you can use to log in, and then you’re set! 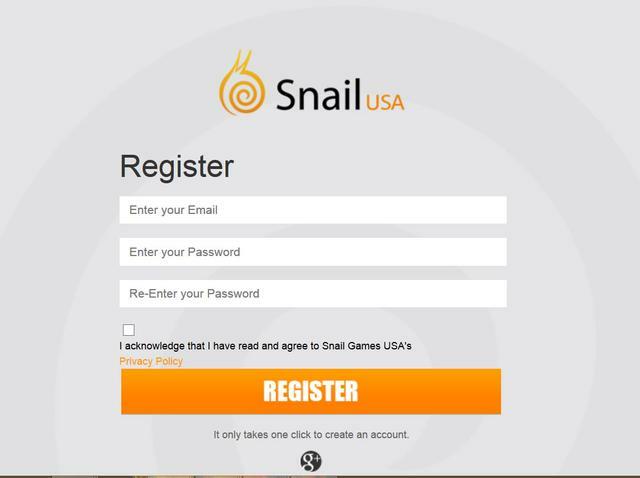 You can register for a Snail Games Passport on the Taichi Panda website at http://games.snail.com/reg.html?from=ht ... en/&gid=38. Once you have registered, you can use your Snail login and password to enter the game. If you have already created a Quick Register or Guest account, but would like a Snail Passport, it’s really easy to do! 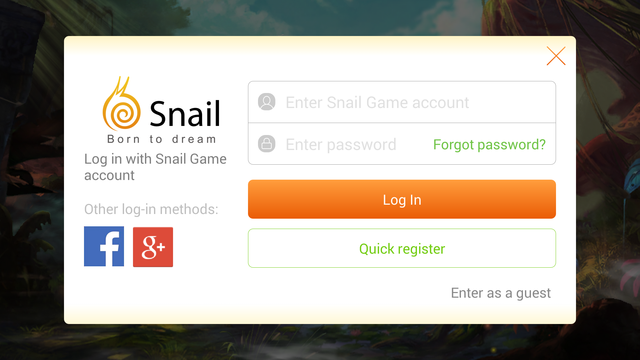 Simply log in to the game, and click the Snail icon, then click on “User Center”. There you’ll be able to Bind Email, which will connect your account to your email address. 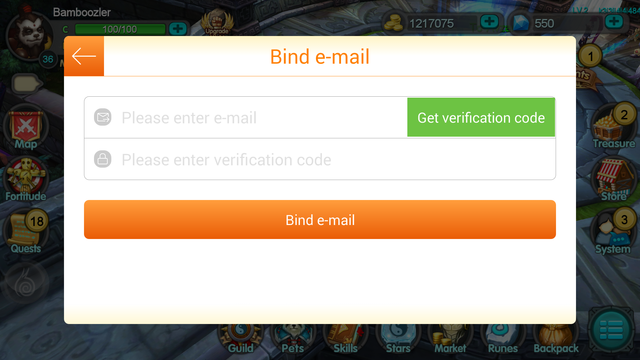 The system will send a verification code to your email, enter it in the space provided to Bind your email. After that, simply use the same email to register for a Snail Passport, and vuala! You’ve got a working Snail Passport, tied to your account. Logging in with Facebook or Google+ is also really easy! Just go to the “Create a new account” menu, and click on the respective logos. This will redirect you to the Facebook/Google+ pages, where you can log in and approve the required permissions for Taichi Panda. After that, you’ll be able to log in with your Facebook or Google+ accounts! Perhaps you’ve logged in with different accounts, and you’re not sure where to find your characters. Don’t worry, they haven’t been eaten by the Porcine Commander! Simply visit the account login menu, and open the scroll-down menu to find all the accounts you’ve used before. Find the correct account, and be sure to select the correct server, and your characters will be waiting for you, eager for their next adventure! If you experience any problems besides those covered in this guide regarding your account, simply contact Support@SnailGamesUSA.com for help. How to get your lose account ? without knowing your level 26 then going back to level 1 with same FACEBOOK email use ? Hello there , i don't know if this is the right place to post this but i have a billing problem.i just bought in game diamonds worth of 49,99 dollars.the transaction has been made and then the game restarted. I entered back in the game but i didn't get any diamonds.but the transaction from my bank account has been made.and i have the proof .the bill with the transaction .could you fix this ? My in game name is " artemis " . I have problem...i play 4 day game.I logg with my facebook acc and have 2 char. But today i logg to play with same fb acc but i must start to play from lvl 0 and my char are deleted..Idk What is probelm, coz loggin 100% is ok.
Hello my acc Name is Kymcway and my char lvl 32 named Kymcway is automaticly delated? What can I do? KYMCWAY wrote: Hello my acc Name is Kymcway and my char lvl 32 named Kymcway is automaticly delated? What can I do? MATKOGS1@HOTMAIL.COM wrote: I have problem...i play 4 day game.I logg with my facebook acc and have 2 char. MARCELINOS_07@YAHOO.COM wrote: Hello there , i don't know if this is the right place to post this but i have a billing problem.i just bought in game diamonds worth of 49,99 dollars.the transaction has been made and then the game restarted. I entered back in the game but i didn't get any diamonds.but the transaction from my bank account has been made.and i have the proof .the bill with the transaction .could you fix this ? My in game name is " artemis " . 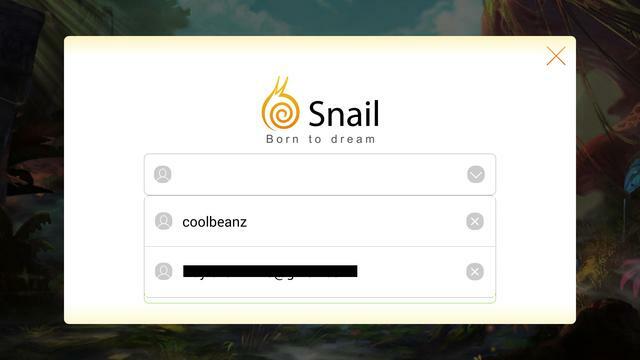 All of you should contact support at Support@snailgamesusa.com with a description of your problem, your IGN, server and your Snail account's email. They will reply as soon as possible!